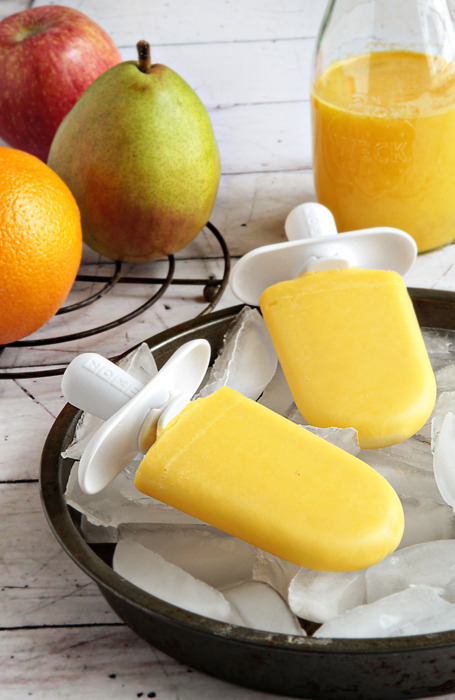 Quick Pops don’t have to be just for dessert! Imagine the surprise and delight on the kids’ faces as you hand them a Zoku Quick Pop chock full of freshly juiced strawberries, bananas, and (shhhh!) kale, next to their breakfast oatmeal. They certainly don’t need to know all the wonderfully healthy vitamins they’re taking in. Plus, ice pops for breakfast = coolest parents ever. Consider all the combinations of fresh juice you can make; orange and pineapple, apple and black currant, carrot, strawberry and blueberry - the possibilities, and fun, are endless! In a liquid measuring cup with a spout, stir together the apple, pear, and orange juices. Remove Zoku Quick Pop Maker from the freezer. Insert sticks and pour the chilled Apple, Pear, and Orange juice base into each cavity until you reach the fill line. Let freeze completely and remove the pops with the Super Tool. Repeat with remaining juice.